Original photo by James Allen. Slightly enhanced image above by Stephanie Lincecum. 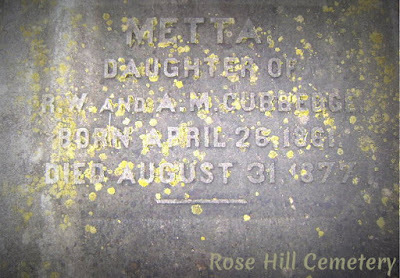 Metta Cubbedge was born 26 April 1861 in Georgia to Richard W. and Anna M. Cubbedge. The beginning of 1877 saw Metta as a bright scholar of the junior class at Macon, Georgia's Wesleyan College. She was described, in reference to her role as a student, as "faithful to every duty, never by word or action, disobeying her preceptors." Metta also had an active extracurricular life. She was President of a secret literary society (it was only allowed to maintain a member number of 30) at Wesleyan known as the Philomathean* Society. She also seemed to enjoy singing. Newspaper articles included her name when describing performances by Macon's Baptist Church choir, as well as Wesleyan's Philomathean Society. Miss Metta Cubbedge was often singled out as a soloist. She was described as having a "sweet modest voice." And her rendition of a song called "The Old Arm Chair" was noted as having a "tender pathos and sweet, sad music." 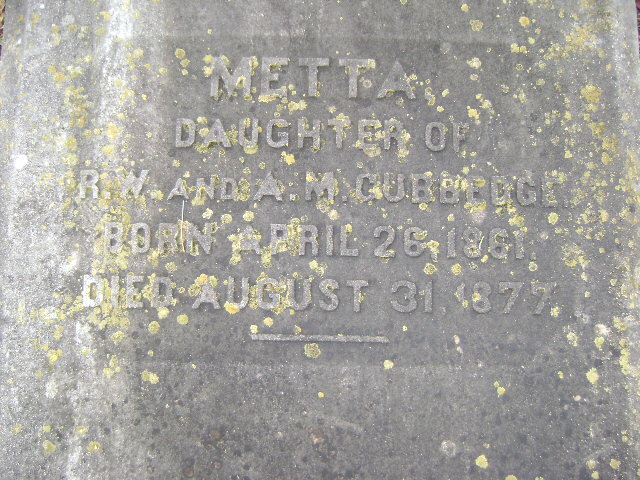 But before the summer of 1877 ended, Metta was dead. The young 16 year old was struck down by typhoid fever. An illness that lasted a mere 10 days. Before I share a couple of articles about Metta's death and funeral, I'd like to pose a question: Was Metta's death forseshadowed? If I read an article about her funeral correctly (it's transcribed below), a "dying companion" told Metta she would either die young, die soon, or something of the sort. Please comment with any thoughts you might have on this, especially if you think I'm way off base. 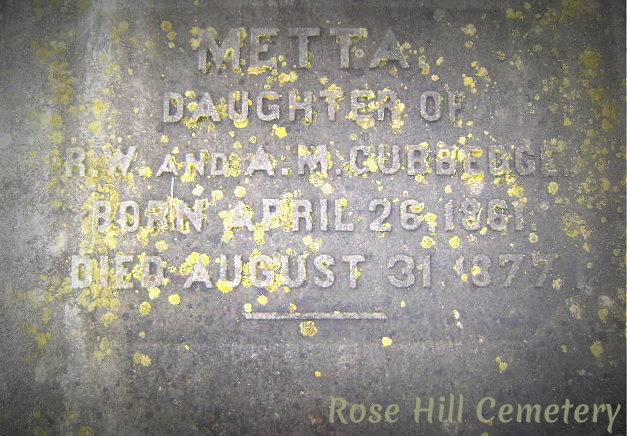 Death of Miss Metta Cubbedge. The sad intelligence of the death of this young lady reached the city yesterday and threw over her large circle of friends and acquaintances a profound feeling of sadness. She is a daughter of Mr. R. W. Cubbedge, a prominent banker of this city, and had been spending the summer at Griffin, Georgia, with friends, where she had won by her gentle deportment a host of ardent admirers. About ten days ago she was taken ill with fever, which rapidly developed into typhoid, and ended her young life yesterday at ten and a half o'clock. A telegram Friday evening announcing that all the symptoms of the disease were better, deterred Mr. Cubbedge from going up with his family physician, Dr. Boone. Another yesterday morning brough[t] the sad intelligence that she was sinking, and in a few hours after she died. The remains were brought down on the Central railroad yesterday evening and the funeral will take place from Mr. Cubbedge's residence, on College street, this morning. All who knew Miss Metta Cubbedge loved her for her many traits of character. She was a member of the junior class at the Wesleyan College this past year and all her companions were devotedly attached to her. Her rendition of the "old arm chair" will never be forgotten by those who heard it for its tender pathos and sweet, sad music. She was just verging into womanhood, but the fair flower has been rudely broken by the hand of death. We tender our sincerest sympathies to the bereaved parents in this sad hour of their mysterious affliction. Funeral of Miss Metta Cubbedge. The services were conducted at the grave, and Rose Hill had another fair sleeper awaiting the end of all things. A strange presentiment has, it seems, taken possession of the young lady, that she would soon die in verification of a remark made by a dying companion some two years since, and, during her sickness, she spoke frequently of death and expected the coming of the grim messenger. *It's also interesting to note another role Metta played in history. The Philomathean Society, founded at Wesleyan College in 1852, and of which Metta Cubbedge was President for a time, later changed its name to Phi Mu. The sorority is active today with more than 228 chapters and is considered to be the second oldest secret organization for women.